Like many families at the time, my family had a Commodore 64 and while I’m sure the idea was for me to become some kind of computer protegee, I really just played games. A lot of games. Namely things like Mario Bros., various Asteroids clones, and Congo Bongo. I did try to break out of that rut by playing Gruds in Space, some weird alien text parser, but aliens used to really freak me out and I got scared way too easily. That and ain’t nobody got the attention span for a text parser. 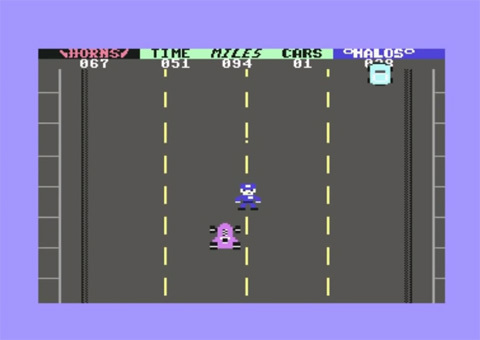 But my favorite game of all on the Commodore 64? Speed Racer. And it has nothing to do with the anime of the same name. 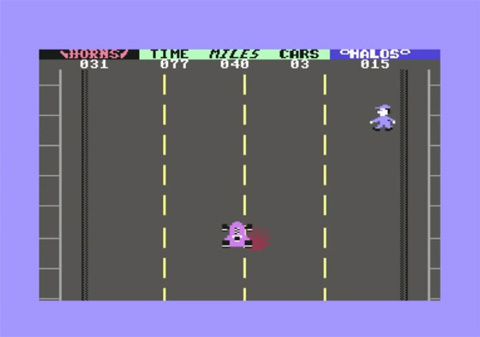 Speed Racer was published in 1983 by T & F Software, who only made four games for the C64. 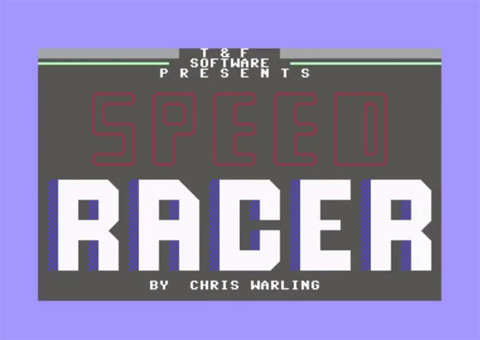 Speed Racer programmer, Chris Warling, worked on a couple games for other companies as well. In Speed Racer, you control a car as it goes down the street. 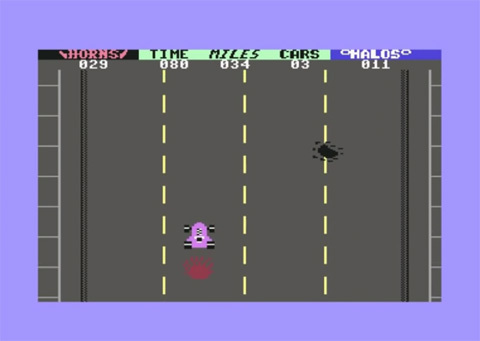 The sound effects and graphics are about what you’d expect, perhaps less sophisticated than other C64 games. But wait. This is where things get interesting. 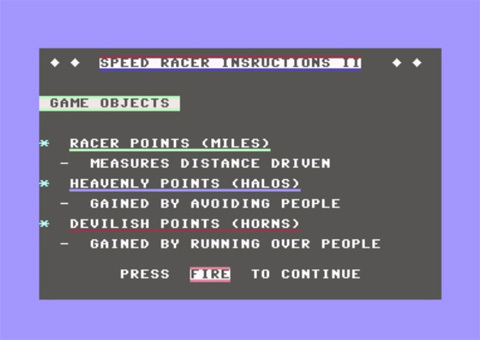 As you can see in the instructions, you got “Heavenly Points” for avoiding people and “Devilish Points” for running over people. Wait, what? Is this game promoting running over people? For points? 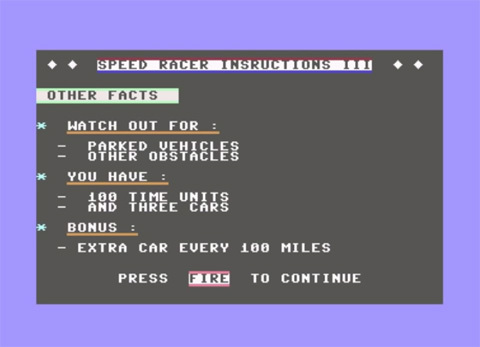 Okay, maybe not… there’s other facts out there, maybe this is a regular racing game as the title implies and not some vehicle of murder. Hmm, this car is heading toward that old lady, it’ll swerve in time though, right? OH DEAR LORD THAT POOR OLD LADY IS A BLOOD SPLATTER ON THE ROAD! And a Police Officer?! WHY IS THERE NO PEDESTRIAN WALKWAY?! What kind of weird German Autobahn is this?! Remember those Heavenly and Devilish Points? A Devilish Point doesn’t deduct from a Heavenly Point or vice versa. You don’t pick sides like Black and White. You start this game, you’re a cold blooded killer. You didn’t even turn around to help anyone you ran over. That’s a hit and run, and I’ve seen enough news stories on Detroit TV stations to know that’s bad. As terrible as this game is, in the sense that you probably should avoid running over people on purpose IRL, it’s an awesome game. I don’t remember seeing blood splatter in another game until Mortal Kombat came out for the Genesis but there’s bound to be more out there. For a title that lurked in a big box of C64 games my parents had in the 80s and I happened upon by accident, it’s a pretty great find. 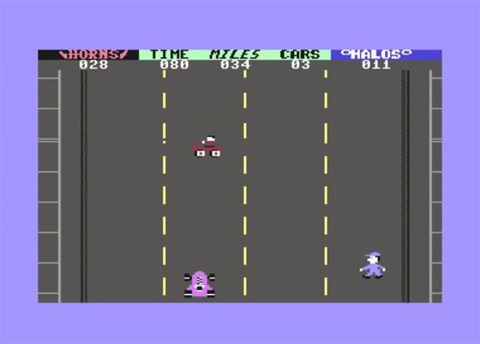 Did you ever play Speed Racer for the Commodore 64? 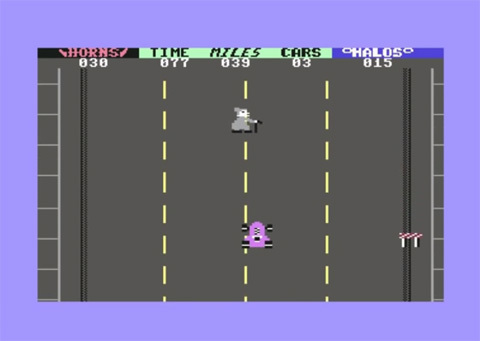 What were some of your favorite Commodore 64 games? Let us know!